On Saturday, the short-benched Storm headed to Nottingham and put on a fierce display, with Nottingham taking the victory with two power-play goals, despite Storm taking a lead just 20 seconds into the game. The following night, Panthers came to the Storm Shelter, and Storm came in looking to defend their fortress. It was a well-fought, physical game from the first whistle last night, and Panthers were the first to sit in the box, when Lachowicz got a call for tripping, giving Storm the upper hand. Just five minutes into the game, Olsen received a minor penalty for cross-checking. Storm’s first penalty ended up with Barnes in the box sitting in for Ginn, for delay of game. This was due to the new rules of the game, where if netminders can play the puck they should, rather than freeze it. The first goal of the evening, went to Panthers at 10:32, when Hurtubise ripped it top shelf on the power play. Storm and Panthers then both received coincidental penalties, with Moffat and Lepine for roughing and Panther’s Lee a two minute minor for cross-checking. This left Storm on a five on four powerplay for two minutes, they took their chances but were shut down by Garnett, who gloved the puck at any opportunity. 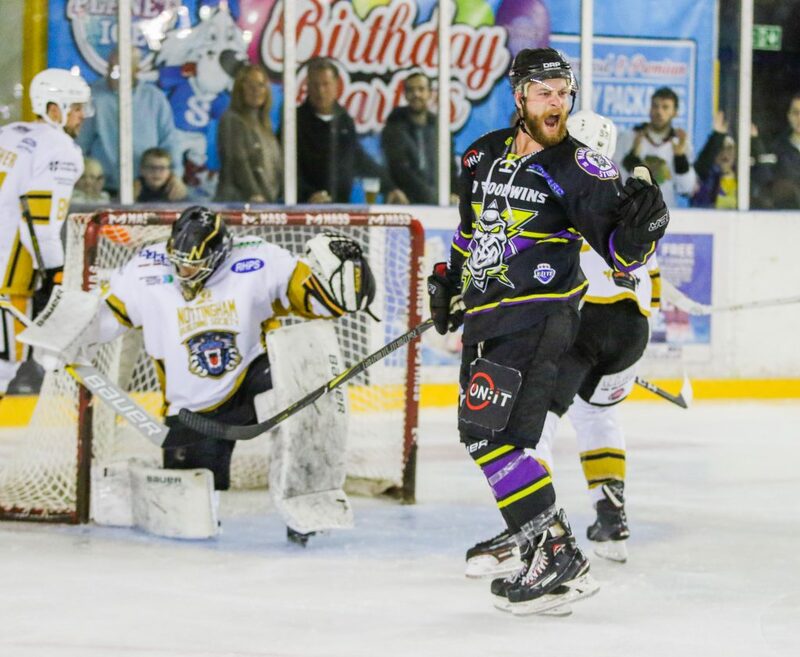 At 15:47, Moffat sat again for delay of game, followed by Panthers’ Pither – who received two minutes for goalie interference less than a minute later, leaving Storm on a short power play. With four seconds left on the clock in the first period, Panthers conceded a two plus ten penalty, with Biggs sitting in for boarding, giving Storm the upper hand in the second. Storm came out strong on the power play in the second period, doing everything they could to level up. They finally got their wish when Springer hit home at 24:57 on a one timer, assisted by Richardson. Storm then got another chance on a five on three, when Panthers received a delayed penalty, plus an extra two minutes, with Henderson for hooking, then Rissling for holding. The second goal of the evening for Panthers was scored at 35:41, on a breakaway, unassisted by Kovacs. It was looking to be a brilliant second period for Kovacs, as just two minutes later, he struck again for Panthers, picking up a rebound, assisted by Hurtubise and Guptill. Storm kept it a relatively clean period, with the only penalty going to Bakker, for hooking. Otherwise, the second period had it all, handbags, breakaway opportunities and some cracking saves from both sides, with Ginn receiving 19 shots on goal – double the shots that Garnett faced. The third period saw a change of netminder for Storm, with Pacl stepping in to fill Ginn’s spot between the pipes. Just two minutes in, Guptill slotted Panthers fourth goal home at 42:13, assisted by Kovacs and Hurtubise. Storm went on the penalty kill when Basara sat for tripping, but Panthers were not able to get anything past Pacl, who made some skilled saves throughout. Things became extremely heated in the final ten minutes of play, as both lines on the ice went at it, piling up. Both teams got coincidental penalties, with Storm’s Moffat and Stadel and Panthers, Lepine and Lee, in the box for roughing at 50:59. Byers, who originally conceded a penalty for delayed hit, followed by another two for unsportsmanlike conduct, was escorted off the ice for the remainder of the game. Springer sat in the box at 51:35, for delay of game, making it a four on three penalty kill . Just as Storm return to four skaters, Linsmayer received a minor for hooking. There were penalties handed out between both sides for the remainder of the game, with end to end hockey and the netminders not chancing anything. Overall it was a hard-fought, challenging game for Storm, who did their best short benched, with four players recovering from injuries and Speirs icing for NIHL side, Sheffield Steeldogs. Ginn and Pacl both received 53 shots on net between them, and Garnett received 27 shots on net overall. Man of the Match for Panthers went to #15 Justin Kovacs. Man of the Match for Storm went to #91 Evan Richardson. 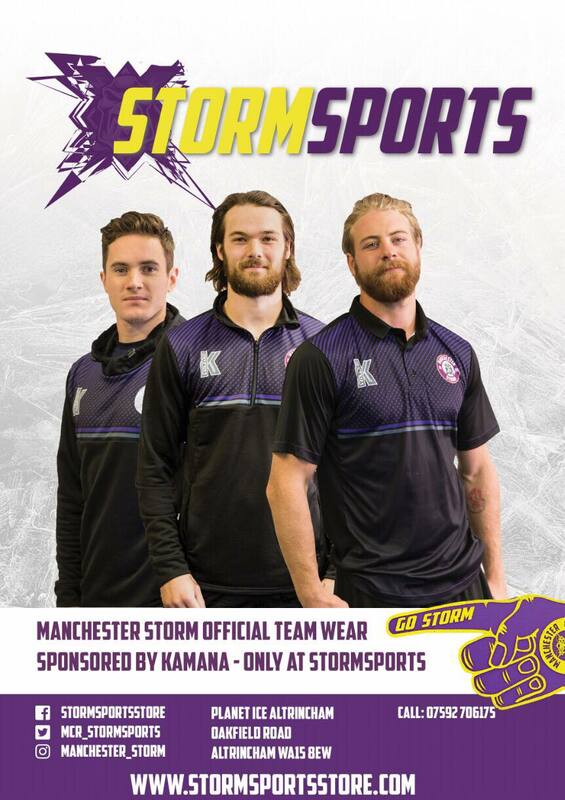 Storm’s next home game is against Glasgow Clan this Sunday, 17:30 face-off!